23 For I pass on to you what I received from the Lord himself. On the night when he was betrayed, the Lord Jesus took some bread 24 and gave thanks to God for it. Then he broke it in pieces and said, “This is my body, which is given for you. 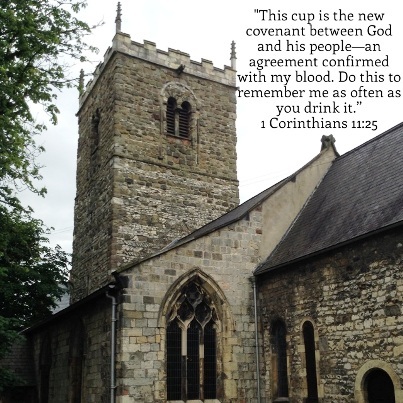 Do this in remembrance of me.” 25 In the same way, he took the cup of wine after supper, saying, “This cup is the new covenant between God and his people—an agreement confirmed with my blood. Do this in remembrance of me as often as you drink it.” 26 For every time you eat this bread and drink this cup, you are announcing the Lord’s death until he comes again. During the first Passover, the community of Israel sacrificed a lamb, covered their doors with the lamb’s blood, and then shared in a meal which included meat from the lamb. The Lord gave Moses and Aaron these instructions for the community, and those who believed were spared from the Angel of Death. Death passed them over that evening; they did not lose their first born male children to the Angel of Death. God made a covenant with the community of Israel, and those who believed and acted on the instructions he gave them received God’s mercy and grace. Later, the Lord himself became that lamb; he came to serve us and die for us. We have to accept and receive this sacrifice and believe that it was done for us so that our sins could be forgiven and so that we could have everlasting life. We are to take the Lord’s example and use it in our everyday lives; we should sacrifice for each other, serve each other, and love each other. God gave us the example and the guidance as to how we are to live our lives and what we have to do to accept the salvation he offers us by grace. We are to proclaim the Lord’s death until he returns by gathering together and sharing in the Passover meal as death and sin pass us by. We receive the bread which is a symbol of his body broken for us, we share in the wine because it represents his blood which was shed for us. This is the new covenant he makes with us; we have to believe and accept his grace. We are to do this as often as we do in remembrance of what the Lord did for us, and we are to follow the instructions he has given us until he returns again.